Tiny starfish larvae use a complex and previously unknown survival mechanism involving whorls of water that either bring food to them or speed them away to better feeding grounds. The larvae—each smaller than a grain of rice—spend 60 days and 60 nights paddling the open ocean, feeding to accumulate the energy needed to metamorphose into the familiar star shape. Along the way the larvae must make trade-offs between paddling in search of food and becoming exhausted by the journey. In Nature Physics, a team of researchers reveals the mechanism that allows them to survive to adulthood. “We have shown that nature equips these larvae to stir the water in such a way as to create vortices that serve two evolutionary purposes: moving the organisms along while simultaneously bringing food close enough to grab,” says Manu Prakash, an assistant professor of bioengineering at Stanford University and recent MacArthur Foundation “genius” grant winner. Using experimental techniques that capture the visual beauty and mathematical underpinnings of this mechanism, the researchers show how the shape and form of starfish larvae enable the functions that are necessary to support life. William Gilpin, first author of the paper and a graduate student in the Prakash Lab, says these findings shed light on similar evolutionary challenges involving dozens of marine invertebrates that are related to starfish larvae in a key way. These experiments began in the summer of 2015 at Stanford’s Hopkins Marine Station in Pacific Grove, California. The researchers were taking a course on embryology when they began to wonder about the evolutionary underpinnings of the starfish larva’s shape—why did it end up looking as it did. Bringing this curiosity back to the lab, the group studied the organisms in a systematic way, feeding the larvae nutrient algae and observing their movements with video-enabled microscopes. Gilpin says the vortices were puzzling because they seemed to make no evolutionary sense. It took a lot of energy to create spiral flows of water; thus a larva with just three imperatives—feed, move, and grow—must have a reason to expend such effort. Once the researchers figured out how the larvae made the water swirl, that understanding led them to the why, and the experiment zeroed in on one of evolution’s most prevalent structures, the cilia, from the Latin word for eyelashes. Imagine that the cilia on a starfish larva are like the oars that might be used to row an ancient galley—except that each larva has about 100,000 oars, arranged in what researchers call ciliary bands that gird the organism in a pattern far more complex than any galley’s oars. The rowing metaphor hints at the complexity the researchers found as they studied how these 100,000 eyelashes paddled the larva through water. Like oars, the cilia had three potential actions: forward, reverse, and stop. 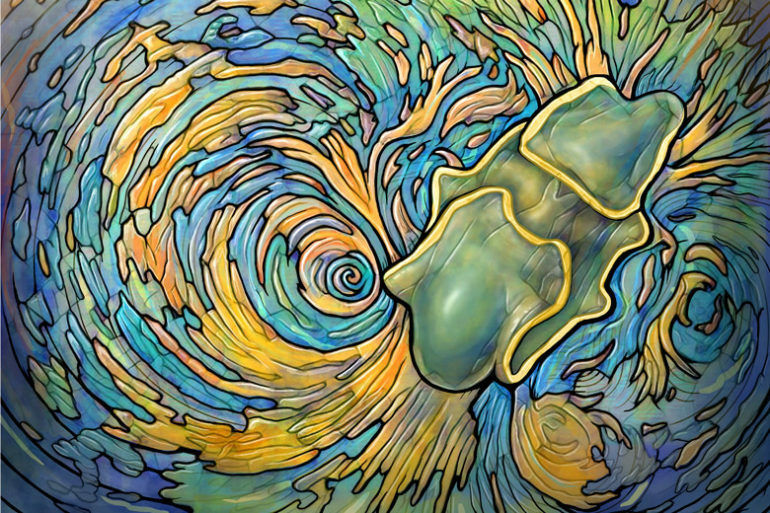 And just as with oars, the cilia moved in different synchronized patterns to create different motions. Presumably orchestrated by its nervous system, the larva beats its 100,000 eyelashes in certain patterns when it wants to feed, so as to swirl the water in a way that brings algae close enough to grab. Then, with a different flutter of eyelashes, the larva creates a new pattern of whorls and speeds off. The researchers realized that they were observing an active and previously unknown mechanism that improved the larva’s odds of survival. The physical structure of the starfish larva, controlled by its nerves, allows it to make feed-versus-speed tradeoffs—lingering whenever algae are plentiful, then darting off should nutrients grow scarce. As they considered the implications of these findings, the researchers hypothesized that this feed-versus-speed mechanism likely applied to other invertebrate larvae that—though different than starfish larvae in form—are nonetheless known to have similar ciliary bands. In future experiments the researchers plan to use the same techniques to study these other larval shapes. What they hope to learn is how evolution has taken a certain mechanism, the ciliary band, and solved the same feed-versus-speed trade-off in dozens of different forms and shapes. Partial funding came from the US Army Research Laboratory’s Multidisciplinary University Research Initiative and the National Science Foundation.